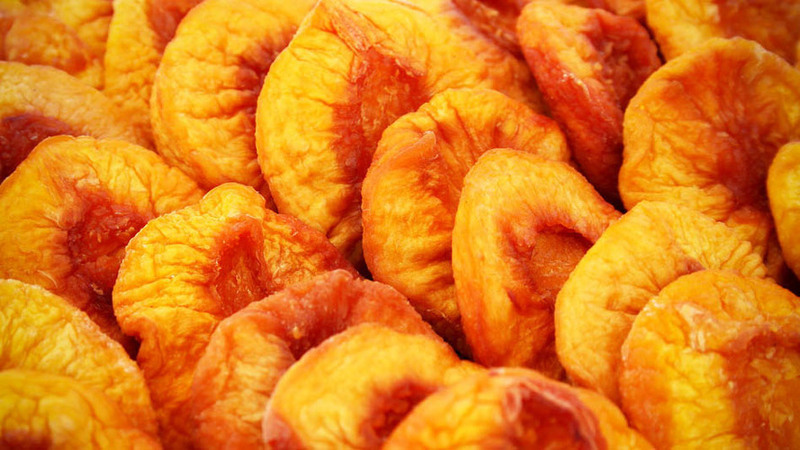 Dehydrating peaches makes for a wonderful snack plain or mixed with other dried fruits. Dehydrated peach chunks are also a personal favorite when added to oatmeal and granola. The dried peaches will benefit from an ascorbic acid dip, sulfite dip, or syrup blanching to inhibit oxidation and discoloration. Canned peach slices also dehydrate quite well if you want to skip the the blanching step and will yield a product that is more like dried, candied peaches. Just give canned peaches a rinse under tap water to remove excess syrup before storing in the dehydrator trays. Rinse the peaches under cool water. Check the peaches to remove skins -- plunge into boiling water for 30 seconds followed by a rinse under cool tap water. The skins should peel off easily. Chop the peaches into halves, quarters, or smaller, removing the pits. Smaller slices will dry faster, so if you are drying in a convection oven or in sunlight, you'll likely have better luck with thinner slices. If you plan to use syrup blanching, chop the peaches into halves and pit. Optionally, treat peach slices with an ascorbic acid or sulfite dip. Syrup blanching will also help preserve the fruit, but will change the quality of the final product closer to candied peaches. Pre-treatment is crucial if using a convection oven for the drying -- as this will take 2-3 times as long as a dedicated food dehydrator. Line dehydrator trays with plastic wrap or food-safe nylon or polypropylene mesh to prevent sticking. Dehydrate for 8-12 hours if using a counter-top food dehydrator with a fan, or consult your food dehydrator's manual for the recommended drying time. Drying in a convection oven can take 24-36 hours and is not recommended. The dried peaches will be leathery in feel and texture when they're ready. Leave the dried peaches overnight in freezer bags to allow the moisture density to equalize between the fruit pieces. Place the dried peaches in the refrigerator or freezer until you are ready to eat them.